Neymar, in full Neymar da Silva Santos, Jr. was born February 5, 1992, in Mogi das Cruzes, Brazil. He is a Brazilian football (soccer) player who was one of the most-prolific scorers in his country’s storied football history. Neymar, like many others in Brazil, started off as a street footballer but his father, who used to be a professional footballer, helped him in taking the game seriously so that he could become a professional. Neymar joined the youth ranks at FC Santos when he was only eleven years old and in fact he was accepted into the youth programme at Spanish club Real Madrid but he decided to stay back in Brazil after he was offered a higher pay. Throughout his time at Santos, Neymar scored one spectacular goal after another and his skills became the talk of the football world. As a result, the biggest clubs in the world vied with each other to sign him. In 2013, he signed for Barcelona and immediately made an impact before finally winning the treble with the Catalan club in 2015. During his brief career, Neymar has also become the attacking centre point of the Brazilian national team and helped them reach the semi final of the World Cup in 2014 that was held in Brazil. Neymar is without doubt one of the leading footballers in the world and is all set to become one of the biggest footballers of his generations. With 50 goals in 74 matches for Brazil since debuting at age 18, Neymar is the fourth-highest goalscorer for his national team. He was a key player in Brazil’s victories at the 2011 South American Youth Championship, which he finished as the leading goalscorer, and the 2013 FIFA Confederations Cup, where he won the Golden Ball as player of the tournament. His participation in the 2014 FIFA World Cup and 2015 Copa América was cut short by injury and a suspension respectively, but the next year he captained Brazil to their first Olympic gold medal in men’s football at the 2016 Summer Olympics. 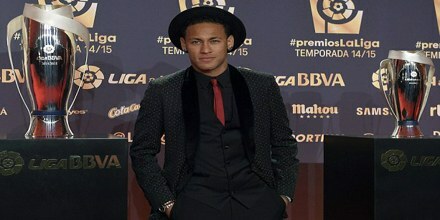 Neymar da Silva Santos Jr. was born on February 5, 1992, in Mogi das Cruzes, São Paulo, Brazil. His father Neymar Santos Senior was a professional footballer and used to be his trainer. His mother’s name is Nadine da Silva. During his childhood, Neymar used to be a well-known player of street football as well as futsal and that helped him hone his skills as far as fancy dribbling is concerned. In 2003, Neymar started representing the youth ranks of the team Portuguesa Santista and moved to the city of Sao Vicente. Neymar joined the famous Brazilian club FC Santos in 2003 when he was only 11 years old and from then he went from strength to strength as a player. Neymar signed his first senior contract with FC Santos at the age of 17. 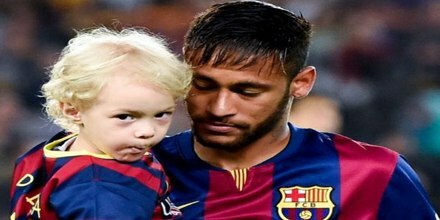 Very little is known about Neymar’s private life but he did have a child (a boy) with a woman named Carolina Dantas in 2011. According to reports, he wasn’t in a relationship with her. The name of the boy is David Lucca and he lives with Neymar. Neymar is a Christian. Neymar has spoken about his faith saying, “Life only makes sense when our highest ideal is to serve Christ!” Neymar reportedly also tithes (10%) his income to his church and has named Kaká as his religious role model. Each year, Neymar organizes a charity match with fellow Brazilian footballer Nenê in Nenê’s hometown of Jundiaí, with the purpose of raising food for needy families. Neymar has signed many sponsorship deals since his reputation rapidly grew from the age of 17. In March 2011, he signed an 11-year contract with American sportswear company Nike. In the same month, Panasonic paid US$2.4 million to secure Neymar’s services for two years. On 8 May 2013, Neymar was rated by SportsPro magazine as the most marketable athlete in the world, ahead of Lionel Messi (2nd) and Cristiano Ronaldo (8th). In November 2012 advertising agency Loducca, created Neymar’s own personal brand logo, featuring the N, J and R (Neymar Junior) with the N styled to match Neymar’s shirt number 11. Neymar starred in a 2014 advert for Beats with other global football stars including Thierry Henry and Luis Suárez, with the theme of ‘The Game Before The Game’ and the players pre-game ritual of listening to music. 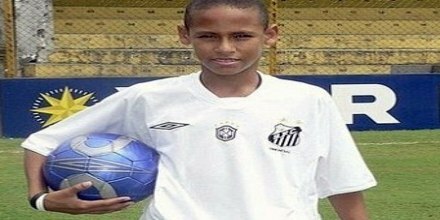 Neymar joined the youth system of Santos FC at age 11. News of his abilities spread to Europe, and he was offered the chance to continue his development with Real Madrid C.F. at age 14, but the Santos team’s management reportedly convinced Neymar to stay put with a large bonus. In 2009, Neymar made his senior team debut for Santos FC and over the next four years he became a prolific goal scorer for his team as he helped them to win the Libertadores Cup. He scored a total of 54 goals in 103 appearances for the club and throughout his time at the club he was being courted by the biggest clubs in Europe. In fact, he had been accepted by the Real Madrid academy at the age of 14 but he stayed back with FC Santos after the club offered him a better salary. After being controversially overlooked by Brazil football team manager Dunga for the World Cup in South Africa in 2010, Neymar made his international debut in a friendly later that year. The following year he netted twice for Brazil in an unsuccessful Copa America campaign and a year later he scored three goals in the Olympics to win a silver medal for Brazil. In 2010, Santos rejected a £12 million bid for him from English Premier League team West Ham United, and later an offer from another English club, Chelsea, reported to be in the region of £20 million. Despite Santos unwillingness to sell and Neymar himself insisting “I’m focused only on Santos”, his agent, Wagner Ribeiro, indicated that Neymar’s career was elsewhere, stating “He wants to become the best player in the world. On 30 November 2010, Santos sold a 5% share of future transfer fees that he would receive to an investment group, Terceira Estrela Investimentos S.A. (TEISA), for R$ 3,549,900 (€1.5 million). The previous year, his family had sold a 40% stake in Neymar’s sporting rights to the DIS Esporte group who had been a long-term strategic partner of Santos’ football club. On 26 July 2010, Neymar was selected for the first time in the Brazil senior team by new head coach Mano Menezes for a friendly match against the United States to be played in East Rutherford, New Jersey. On 10 August 2010 he made his debut with the national team in that game, aged 18 years old, starting the match and wearing the number 11 jersey. He scored on his debut after 28 minutes, a header coming from an André Santos cross in a 2–0 win for Brazil. On 1 March 2011, Neymar said: “Being on the Brazilian team is a privilege, There are some marvelous players and I’m very happy to be among them.” On 27 March 2011, he scored twice in a 2–0 win against Scotland at the Emirates Stadium. In 2011, the flashy forward produced what would be voted the FIFA Goal of the Year and led Santos to its first Copa Libertadores championship in 48 years. However, he also began to experience the backlash that accompanies fame. Neymar was criticized for his play during Brazil’s quarterfinals loss in the 2011 Copa America tournament, and was scolded in the media for fathering a child out of wedlock. In September 2011, Santos club president Luís Ribeiro threatened to report Real Madrid to FIFA following reports that they had attempted to sign Neymar to a pre-contract agreement, and denied that such an agreement was in place. On 9 November 2011, Neymar and Santos agreed to a contract extension that would see the player stay with the club until after the 2014 World Cup in Brazil. The deal reportedly increased Neymar’s wages by 50%, to the levels that top European clubs would be paying him. Neymar was the leading goal scorer of the 2011 South American Youth Championship with nine goals, including two in the final, in Brazil’s 6–0 win against Uruguay. He also took part at the 2011 Copa América in Argentina, where he scored two goals in the first round game against Ecuador. He was selected ‘Man of the Match’ in Brazil’s first match against Venezuela, which ended a 1–1 draw. Brazil were eliminated in the quarter-finals in a penalty shoot-out against Paraguay (2–2 a.e.t. ), with Neymar being substituted in the 80th minute. Neymar was being courted by the biggest clubs in the world for the better part of his time in Santos FC and after a bitter tug of war between the Spanish giants Real Madrid and Barcelona; Neymar signed for Barcelona in 2013 for a transfer fee of $76 million. The same year; Neymar scored 4 goals in the Confederations Cup as Brazil ended up winning the tournament, beating Spain in the final. In January 2014, the prosecutor’s office in Madrid began investigating the transfer fee that Barcelona paid for Neymar. The documents submitted to the authorities on request contained contradictory information. On 23 January 2014 Rosell resigned from his position as president. A day later, the details of the transfer were revealed by Barcelona; the transfer had in fact cost them €86.2 million (£71.5 million), with Neymar’s parents confirmed to have received a €40 million sum. In the aftermath, Barcelona and Bartomeu were charged with tax fraud. Neymar’s performance shined in the 2014 World Cup on his home turf of Brazil, but was cut short before the finals. On July 4, 2014, minutes before Brazil won its quarterfinal match against Colombia, Neymar was carried from the field in a stretcher in tears of agony after breaking a bone in his back resulting from a challenge by Colombia’s defender Juan Zuniga. With their star player sidelined, Brazil’s hope for the World Cup title was dashed when they lost their semifinal match to Germany, 7-1. On 14 October 2014, Neymar scored four goals in one game for the first time in his international career, scoring all of Brazil’s goals in 4–0 friendly win against Japan at the National Stadium, Singapore. At the age of just 22 years, Neymar had scored 40 goals in 58 internationals, and had become the fifth highest goalscorer for his national team. On 26 March 2015, Neymar scored Brazil’s second goal in a 3–1 friendly win over France in Paris. On 14 June 2015, in Brazil’s opening Copa América fixture, Neymar scored the equaliser and assisted the stoppage-time winning goal by Douglas Costa as Brazil came from 0–1 down to beat Peru 2–1 in Temuco. After Brazil’s second match, a 0–1 loss to Colombia in Santiago, Neymar was booked for handball, resulting in a suspension. After the final whistle, he was red carded for deliberately kicking the ball at Pablo Armero, and as a result was pushed over by Colombian striker Carlos Bacca, who was also dismissed. CONMEBOL issued Neymar with a four-match ban, ruling him out for the remainder of the tournament, in addition to a $10,000 fine. Neymar primarily plays as either a central striker, second striker, winger or occasionally as an attacking midfielder, and has been described as “a true phenomenon”. He often plays as a left sided forward for both club and country in the team’s 4–3–3 formation, drifting infield, due to his energetic pace and playmaking skills; this position allows him to shoot with his stronger foot, or create chances for team-mates. Neymar’s dribbling skills, tricks and playmaking ability are reminiscent of compatriot Ronaldinho. His common traits are his creativity, passing, finishing, dribbling, feints and technique, being described as both “electric” and “explosive”. Although naturally right-footed, he is capable of scoring with both feet, as well as with his head, and is an accurate free-kick and penalty taker. He commented on his attributes saying: “I’m always trying to perfect everything – dribbling, shooting, headers and control. You can always improve”. Neymar stated that he has been inspired by Lionel Messi, Cristiano Ronaldo, Andrés Iniesta, Xavi and Wayne Rooney. In 2011, Neymar won the ‘World Soccer Young Player of the Year’ award and in the same year he won the FIFA Puskas Award for scoring the best goal of the year. Neymar has been a prodigious talent since he was a teenage star for Santos in Brazil but his greatest achievement as a footballer is the haul of 39 goals in the 2014-15 season at the end of which his club Barcelona won the treble. He scored 10 goals in the Champions League as well and ended up as the join top scorer.